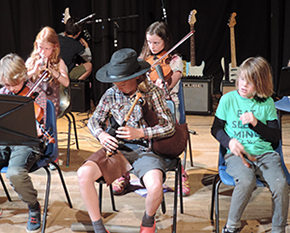 The folk group provides a rich music education for children of an intermediate level. The music focuses on traditional music of the British Isles as well as world folk traditions and historic folk music traditions. The group aims to foster an interest, excitement and knowledge of music equipping students with really good ensemble playing skills as well as inspiring and engendering an interest and curiosity in music. Woven into the structure of the group are the basics of music theory - but taught in a practical way such as understanding how to write harmonies and how to make up tunes.